This week we all got the amazing experience of exploring the Champaign-Urbana fab lab! The lab itself is awesome, decked out with a whole range of machines and utilities to help just about anyone make just about anything. I am upset that I only found out about this amazing place so late, or else I would have seriously considered working there. After the tour, I broke off with the group doing the laser cutting, although I really wanted to check out the arduinos. The software we used to create our images to be cut is called Inkscape, and it was actually really intuitive and easy to use. The software that controls the printer just takes a black and white pdf of your cut, which I thought was really interesting. The thickness/darkness of the lines determines the laser strength, and thus determines whether you just raster (scratch the surface) or vector (cut all the way through). 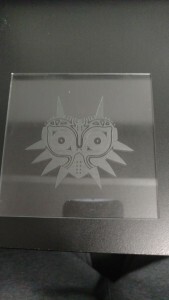 I decided to raster an image onto clear acrylic, because I have seen people online do some cool things with etched acrylic and LEDs. This is what I ended up with after the laser did its thing. I think it turned out really well, and I am going to be 3D printing a base for it, so that it will stand up straight. I’m going leave space for an LED and a battery bay in the base, so that when the LED is on, the light will shine up through the clear acrylic and reflect off of the rastered image (hopefully) and make it look like its glowing. I am definitely going to be coming back here in my free time and I cant wait for this week when we get to revisit the fab lab and check out some more interesting tools! This entry was posted in Reflections, Week6 by Kyle. Bookmark the permalink. Its really cool that you thought about marrying two different machines to help you create and aid for the Acrylic image you made. Great idea for a small project! I personally enjoy seeing the different creations like what you have done in the acrylic, and want to try it out myself. I would love to see the different ways this can be brought together with Arduinos as well!